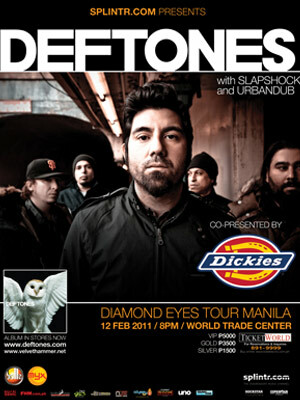 Just a couple more weeks to go, and Deftones will finally land in Manila for their Diamond Eyes Manila Concert on February 12, 8PM at the World Trade Center in Pasay. Speaking of Abe, we hope you were listening to Jam 88.3 yesterday morning, January 26. FHM dropped by and joined DJ Migs to interview the Deftones' drummer, Abe Cunningham over the phone. Awesome right? If you're one of our Twitter followers missed out and are now asking and DM-ing us about where you can listen and or read, here's what we talked about. Migs: You’re in the land down under, how’s the weather there? Here in Manila we’re having kind of a weird weather. It’s rainy but still a little warm. Abe Cunningham: Oh yeah, it’s the same here, it’s hot as hell, it’s humid but I can’t complain, it’s absolutely beautiful, and I’m so happy to be doing what I’m doing. So you know, it’s all good. Migs: How’s the Big Day Out? Abe: The Big Day Out? They call it the big day off, you know, it’s going to be 2 weeks long, but it’s really only seven shows. It’s a really, fun, fun festival, the place is obviously very mellow, and laid back. You see a lot of times, you can scoot around and check out the cities you’re in. We did it a long time ago, actually, not too long, we did it, I think back in ‘03. It’s just super fun man, I’m having a blast. Migs: So right now, you’re in the hotel, and just chilling out, having your downtime, if I’m not mistaken? Abe: I’m looking out the window, man. We play later on tonight, and I’m just looking out the window, and it’s actually, I guess they call it Australia Day today, a big national holiday, and the town is just jumping off, wild everywhere, people are just out of their minds. It’s going to be a wild night tonight. Migs: Speaking of downtime, I mean, everybody loves to hear about how people spend their downtime, especially artists as big as you guys. I believe you guys were into skateboarding back in the day, do you guys still skate? Abe: Chino skates a bit still, I like to cruise around. It’s a general thing that sort of got us all together, when we were kids. You know, it’s like a California thing, it’s worldwide now. But it was just like really, we were kids from California, and it was a common interest that we all had. Migs: Maybe you guys could check out the skateparks we have here in Manila when you come over. Abe: Yeah, I’ve seen some of them, they’re amazing. I’ve seen some photos, they’re killer man, so yeah definitely. FHM: How satisfied is the band with how Diamond Eyes turned out? And what kind of mindset did you and the other guys have while working on the album? Abe: We’re thrilled with the way it turned out. Making records over the years has gotten to be a really, really tedious process. I think honestly, a lot of that was, we were making things harder on ourselves than it really needed to be. Obviously this time around, it was crazy, it was so different to me. Chi had an accident and we were actually working on a record up until that point, it’s called Eros. It hasn’t come out yet, but, we sort of put it on pause after his accident. It turned our world upside down when it happened, and to this day, we’re still wondering what the hell’s going on, and would he be able to come back to us. So, with all that going on, we decided to just try to maybe make some more music. It's a therapeutic thing, getting back together in a little jam room, and just jamming, like we always have for years now. And then all of a sudden, we had our buddy Sergio come in, who’s playing bass. We wrote a couple songs, and it all happened really fast. We decided to turn it into something positive, the best that we could. It’s all about Chi, really it is. There’s no other way that it could be, it’s totally inspired by him. But we tried to just make it into a positive outlet, you know with an optimistic outlook. So I mean, we’re really, really happy with the way it turned out. We’ve been doing it a while now, we had a great time despite everything that has and is still happening with Chi.